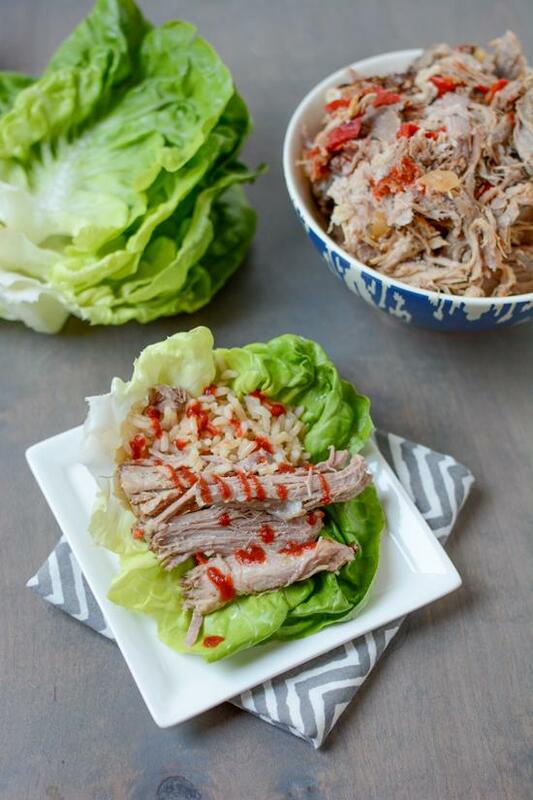 Serve this Slow Cooker Asian Pulled Pork in lettuce wraps with rice for a quick dinner! Thanks to the Ohio Pork Council and the Ohio Soybean Council for sponsoring this post. Lots of you have been asking for quick, easy dinner ideas now that school is back in session and nights are a little crazier. 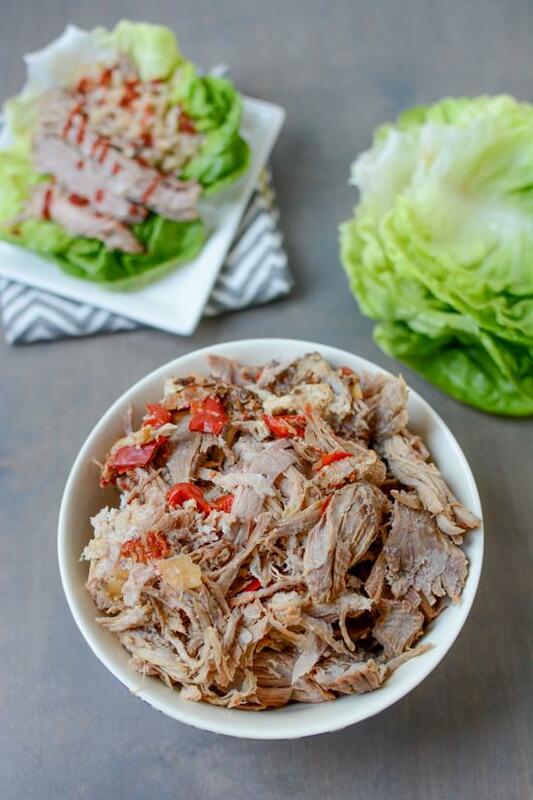 Coincidentally, I was recently asked by my friends at the Ohio Pork Council to share a simple slow cooker recipe made with pork! We eat a fair amount of pork in our house and cooking it low and slow is definitely my favorite way to do it. It’s perfect for food prep because you can easily cook a large amount and use it in a variety of ways throughout the week. Plus it freezes well, so whenever it’s on sale I buy a shoulder, cook it in the slow cooker, shred it and freeze it. Then I can pull it out to put in soups, casseroles, quesadillas, etc on busy nights! My go-to pork recipe is to throw a pork shoulder in the crockpot (or oven) with a bottle of beer, cooked, shred and top with bbq sauce. For this recipe I decided to expand my horizons a bit and put an Asian twist on it! This recipe is super simple. Once the meat is cooked, just shred and eat. OR, if you want to spend an extra 5 minutes on dinner, wash a few bibb lettuce leaves and cook a package of (no salt added!) 90 second rice and make some lettuce wraps like I did! 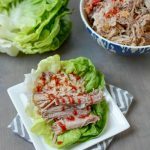 You could also skip the lettuce and just serve the pork with some rice and steamed frozen veggies for a quick weeknight dinner. The possibilities are pretty much endless! A fix it and forget it slow cooker meal. Serve with quick rice and veggies or in lettuce wraps for an easy weeknight meal. Add chopped onion, garlic and red pepper to the bottom of a slow cooker. In a small bowl, combine soy sauce, ginger, thai chili sauce, orange juice and almond butter and stir to combine. Pour over pork, cover and cook on low for 8-10 hours. Shred pork using two forks and serve as desired. Feel free to spoon a little of the cooking liquid over for extra flavor or top with sriracha for added spice! 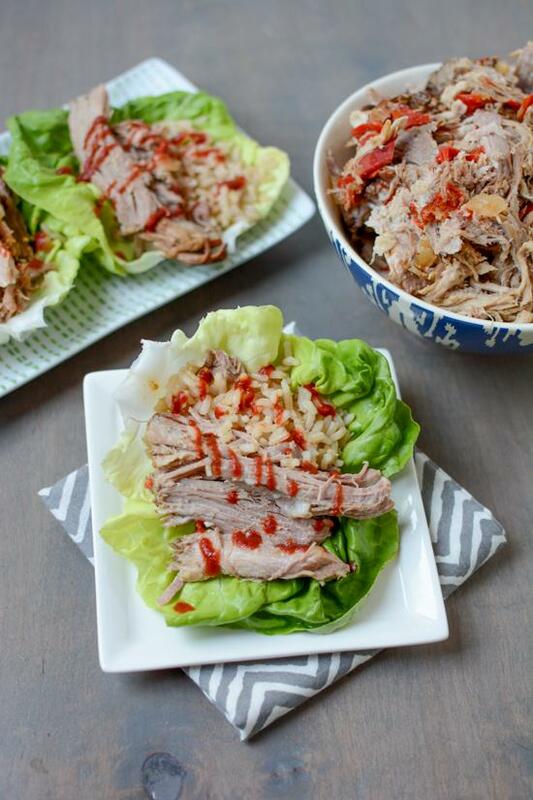 This Slow Cooker Asian Pulled Pork from @leangrnbeanblog is perfect in lettuce wraps! If you have questions about Ohio farms, pigs or pork or questions for the farmers, be sure to visit the Ohio Pork Council’s website or the Ohio Pork Facebook page! They’d be more than happy to answer any questions you may have! The Jewish woman LOVES THIS RECIPE. ok confession i’ve never made pork myself! i like to eat it just have never prepared it, but this looks easy enough! Love how you’ve turned what can be a sort of complicated dish with lots of ingredients into a simple one you can do in the slow cooker. This looks so good, and I’m all for “quick and easy” now that my kids are back in school! Great idea to serve in lettuce wraps too! I love finding new recipes to use in my slow cooker. These look delicious! I will be going to Chipotle, buying their cheapest non-meat bowl and coming over to get my fill. Oh how I love that you suggested wrapping this delicious meat up in Bibb lettuce to serve. Such a genius idea with these Asian flavors! [WORDPRESS HASHCASH] The comment’s server IP (45.33.18.184) doesn’t match the comment’s URL host IP (198.58.123.185) and so is spam.